Royal Pu-erh also called Palace Pu-erh, it was long an annual tribute tea to the imperial court of China. The tea has a high concentration of golden buds, it's weight loss properties and superior flavor make this tea a favorite of both the seasoned Pu-erh drinker and the beginner. 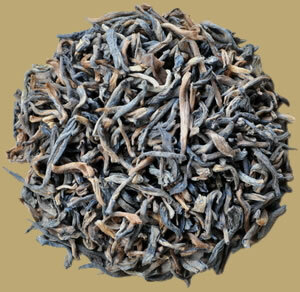 PREPARATION: To prepare Royal Pu-erh, place approximately 2 tsp. of leaf per serving in a teapot. Rinse by covering with boiling water and quickly pour off. Fill with boiling water again and let steep 5-30 seconds (depending on how light or dark you want the tea) and serve. Pu-erh tea may be steeped 10-20 times.